With winter settling in, it can be fun to find little projects around the house that somehow make you think of kayaking (are there projects out there that don’t make people think of kayaking?). Our friend, Michael Morris, is an avid paddle maker. He doesn’t sell them… he just makes them, and paddles with them. With so many paddles, he has lots of wood shavings. For a few years he’s been handing them over to friends to use as kindling. They burn quickly however, and serve best as a way to re-start a fire that’s died down a little too much, rather than start it from scratch. 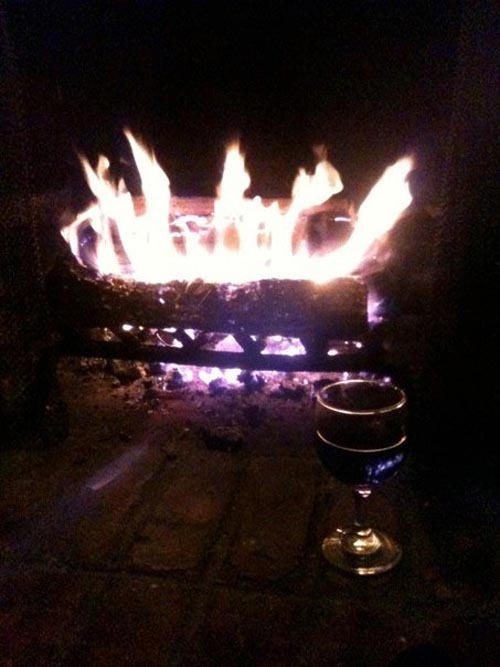 With rain soaked wood, using commercial fire starters ($1 or more each) has become a convenient habit. One afternoon last week we were sitting in our warm house looking outside to a cool and wet day and decided that an indoor project might be nice. We decided to make fire starters. And guess what… they work, so we thought we’d share. 1. 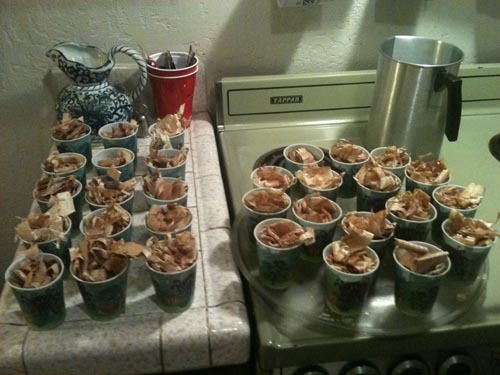 Stuff the Dixie cups full of wood shavings. 2. 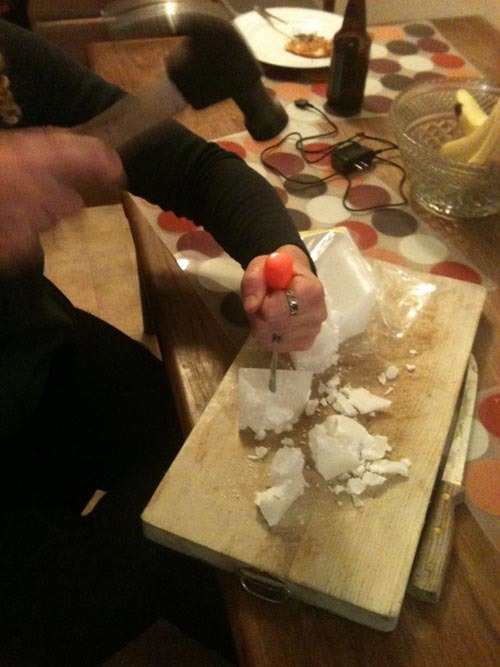 Break the block of paraffin wax by placing a screwdriver or other sharp object onto it and hitting it with a hammer (have the chopping board underneath). Breaking up the paraffin wax. 3. Boil several inches of water in the pot. 4. Put the wax in the melting pot, and place the melting pot in the pot of boiling water. To prevent it from floating away, lay a water filled glass bottle on top. 6. 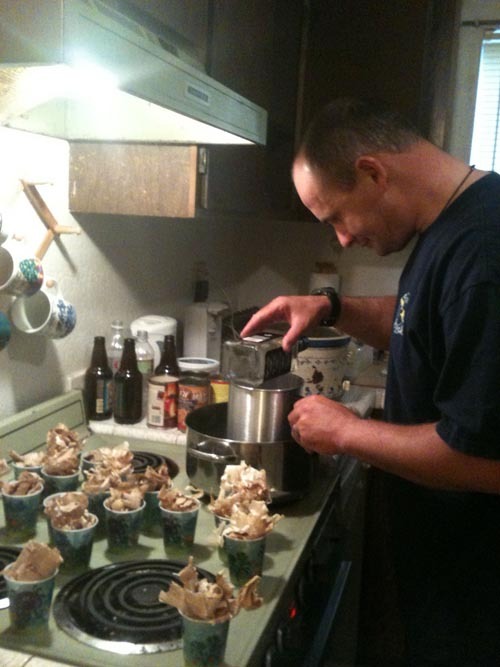 Pour the wax carefully into the shaving filled Dixie cups until they are about half full. 7. Wait for several hours until they are cool. 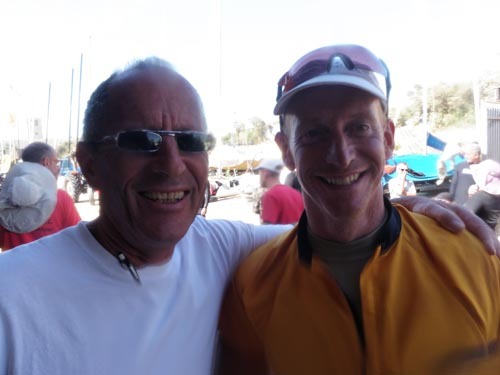 Last week I returned home from the Optimist Kayaking Symposium in Israel. It was my second year at the event and it was wonderful to be back. What makes Israel unique from most places is the warm water, and it is the only event that I’ve been to all year where I left my drysuit at home. 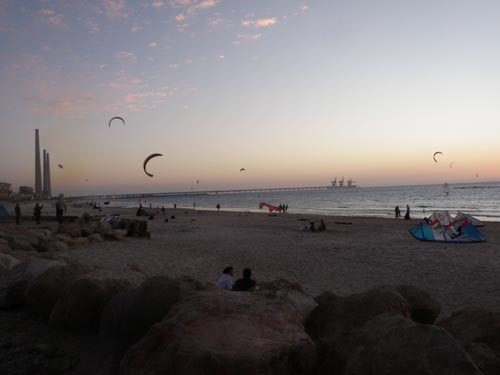 The four day event takes place in the crystal clear water of the Mediterranean near Kibbutz Sdot-Yam, located on the northern coast, and for four days I taught Greenland style classes (mostly rolling) in the warm sun… the rain cleared for exactly the four days of the symposium. Ben Lawry and Jeff Allen were also instructing in all kinds of topics ranging from Incident Management to Edging and Bracing. 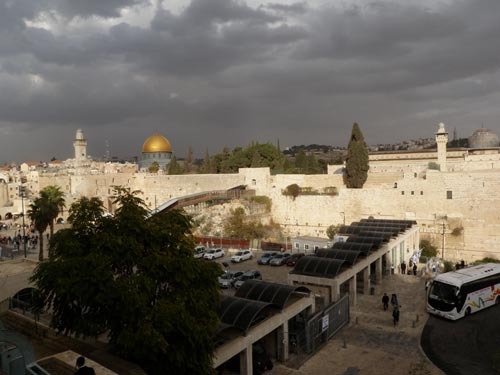 Israel is wonderful in so many ways, and I thoroughly enjoyed the friendly and relaxed people, the weather and the food… the hummus, falafel and tahini can’t be beat. 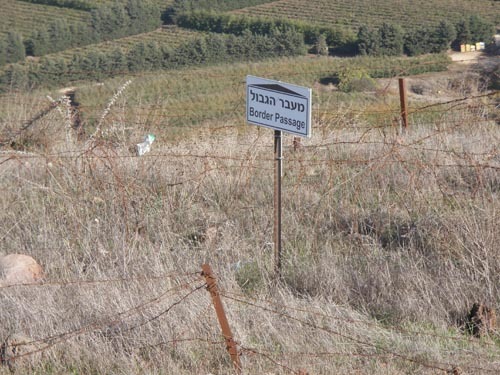 Ehud Dror and Ben Lawry. After four days of instruction we went exploring. 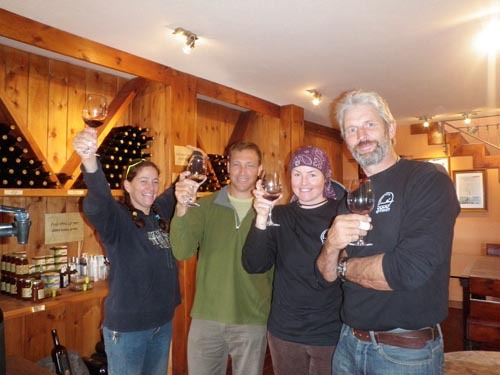 We had two days, and organizer (and totally awesome friend and paddler) Hadas Feldman took us out to be tourists. 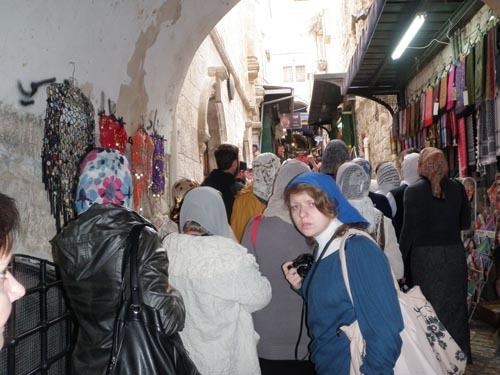 The first day we went to Jerusalem and played around in the marketplace. We visited the Western Wall and Church of the Holy Sepulchre. We also marveled at the teenagers walking around with guns on their backs. 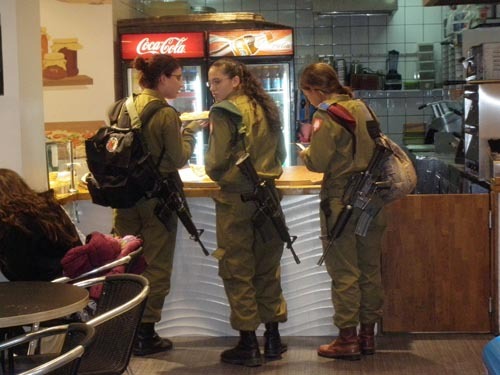 In Israel at age 18 everyone serves in the military, and guns are never left alone, so even if uniforms weren’t being worn, guns were slung over shoulders. 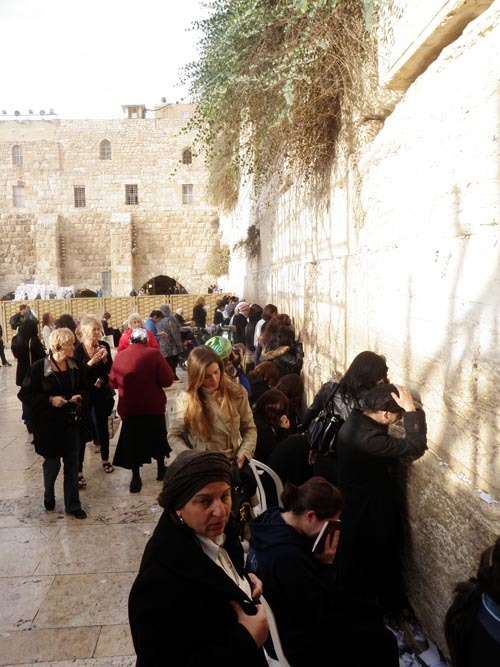 Groups of people filled the streets, many of them on spiritual journeys and many more being tourists for the day. We spent the day exploring, people watching, tasting local food and playing in a very old, and very special, city. Teenagers wearing guns ordering pizza. The next day we went wine tasting then heading to a viewpoint where we had a gorgeous view of the Syrian border from a set of trenches. 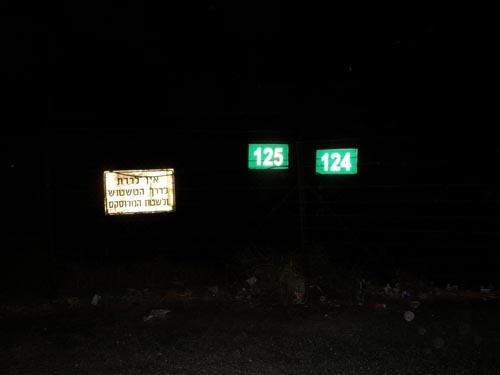 During our travels we also drove next to the Jordan border, and marveled at the strip of dirt next to the border that serves as a footprint indication of anyone getting too close. We played around, stopping at lots of interesting spots, including at the remains of a Syria Mosque. 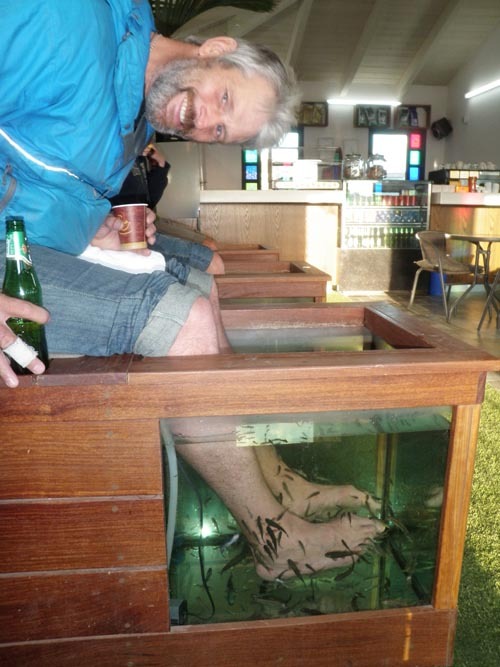 We also went to a spa and had a natural foot treatment which consisted of four fish tanks that we sat on the edge of and hung our feet into, allowing the fish to peck at our feet. Hadas, Zviki, Jeff and myself laughed and laughed as the fish tickled our toes, and although this practice is not common (locals Hadas and Zviki hadn’t seen it before), it made for a very entertaining 20 minutes. We then drank a traditional drink made of orchid bulbs, then headed to some hot springs for a relaxing swim before heading to the airport. Jeff having a fishy foot treatment. 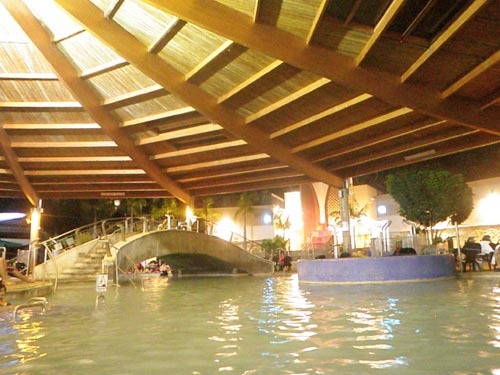 Some very impressive hot springs. Israel is truly a magical place. Thank you to the Optimist Kayaking Club for having me out there! Last week I returned home from the Greenland Week Kayak Festival. The event takes place in Washington and consists of Greenland-style kayaking lessons, demonstrations, social activities and a competition. 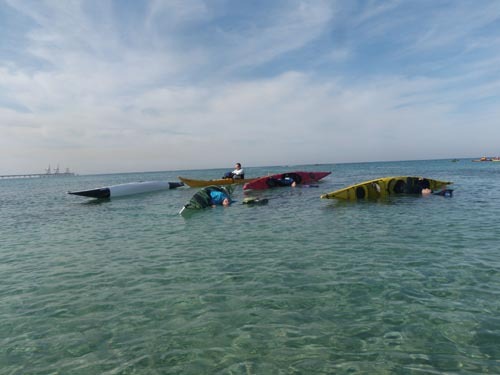 It is organized by The Kayak Academy. Dubside, Maligiaq Padilla and myself instructed, and Jeanette Rogers joined us for judging the harpoon and rolling competitions. 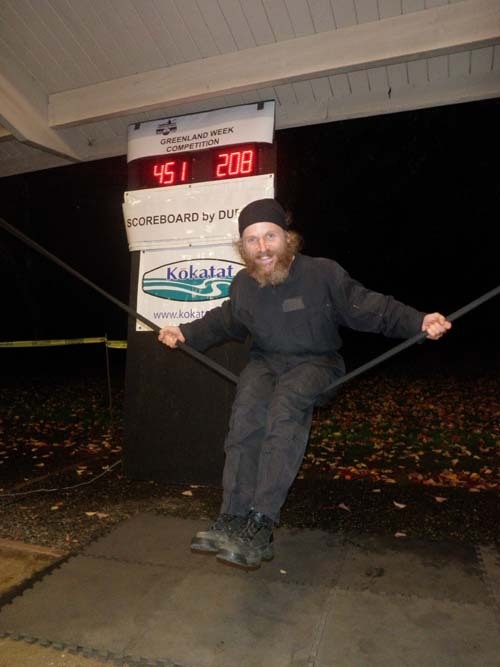 The weekend’s events took place at Lake Sammamish State Park, which was an ideal location with the lake, a covered picnic shelter with a firepit in the center and another shelter that served well for ropes. 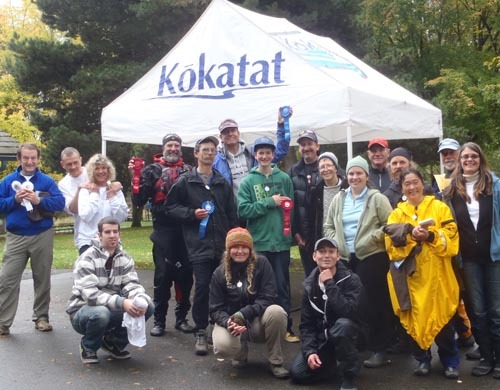 Also, the Kayak Academy runs the concession stand at the park, so participants and spectators had access to hot beverages and yummy treats throughout the weekend. Dubside and his new scoreboard. Friday’s activities included a free rope gymnastics clinic, followed by a ropes demonstration. On Saturday there was a six mile race, a rolling demonstration and a free harpoon clinic. Evening entertainment included a tasty salmon dinner and music by South Sound, as well as a presentation by Rob Avery on kayaking the Aleutian Islands. Sunday consisted of harpoon throwing and rolling competitions. Maligiaq demonstrates how to throw a harpoon. Prizes were announced, with Wayne Horodowich taking the top medal. The Canadians brought in first, second and third places for the rolling competition, and there were lots of raffle prizes handed out. Compete results are available here. The weekend was a ton of fun, and it was good to hang out with the Washington kayakers again. Keep an eye on the Kayak Academy website… there are some exciting changes in store for next year’s event. 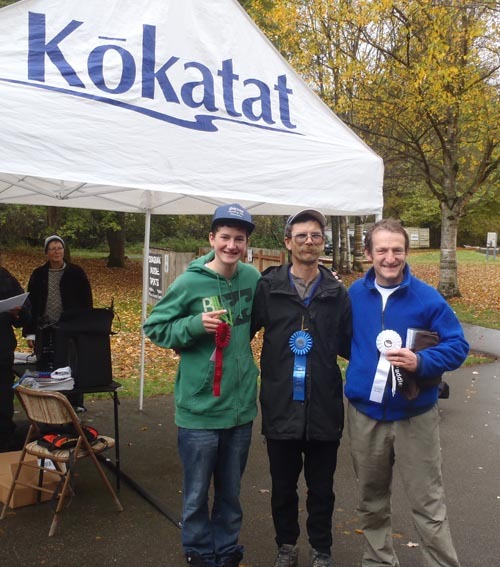 The rolling winners (all from Canada): From left: Christopher Scully, Alan Dunham and Michael Jackson. Photos by The Kayak Academy and Helen Wilson. For me, flying to Manchester, England to instruct at the 6th UK Storm Gathering felt a bit like going back in time. I spent the first seven years of my life living in England, and visited after that, but I hadn’t been back in over 20 years. The organizer of the Storm Gathering, Mark Tozer, is also my fiancée, and it was very cool to have him show me around the place where I spent the first part of my life. We meandered from the airport in Manchester to Anglesey Outdoors, the center for the symposium, detouring through a couple of very cute places; including Conway, a village comprised mostly of a huge castle, and Bangor, a charming university town. We also stopped at the Menai Bridge, and walked across it, while Mark shared stories of his University days (which I won’t repeat here). Once at Anglesey Outdoors, it was good to see some old friends and meet some of the people that Mark has paddled and instructed with on a regular basis. 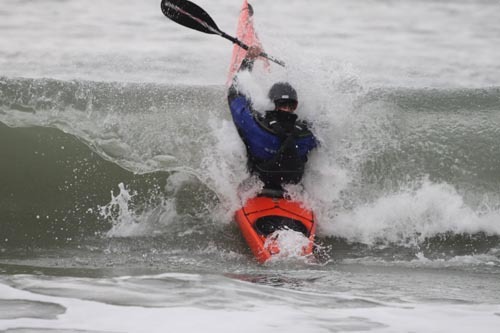 The event is called the UK Storm Gathering because it is late in the season, so the hope is that the seas will kick up a bit, and paddlers will have the opportunity to challenge themselves in conditions that they might not paddle in otherwise. With gale force winds throughout the entire weekend, the “storm” was certainly in effect. James Stevenson breaks through the surf. Throughout the weekend participants challenged themselves, and tired smiles and laughter in the evening showed that the event had been successful. 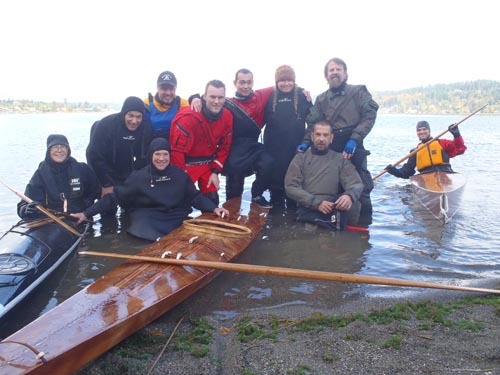 Paddlers were thrilled that they had experienced conditions that they would not normally have gone out in, and I was very impressed with the comptence and judgement of the instructors. 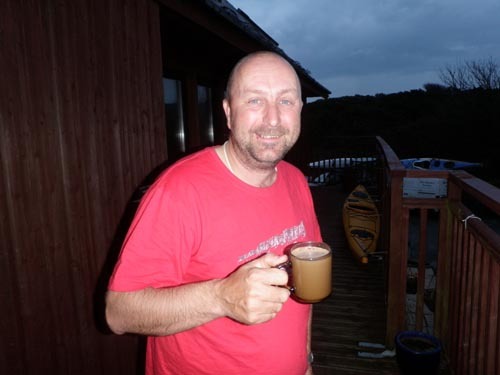 Jim Krawiecki enjoying his morning coffee at Anglesey Outdoors. Evening entertainment at Anglesey Outdoors. 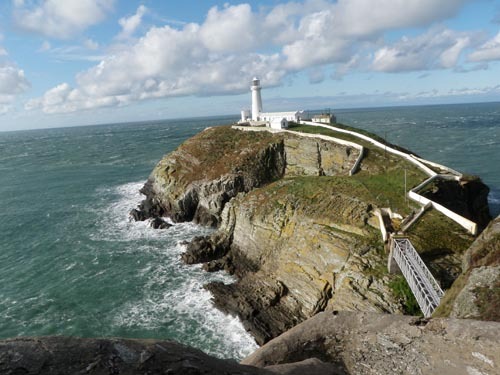 A walk to South Stack. Some of the places that Mark took me for walking or paddling included Bull Bay on the North Coast of Anglesey, Puffin Island on the East Coast of Anglesey, Trearddur Bay near Holyhead, Llyn Padarn near Llanberis and Point Llynas on the North Coast. We also walked out to South Stack and explored Beaumaris Castle. Another thrill for me was going in the shops, which included a traditional sweet shop that sold candy that I remembered from my childhood. After the three-day symposium and a couple more days of exploring, I hopped on a plane to Washington for Greenland Week. 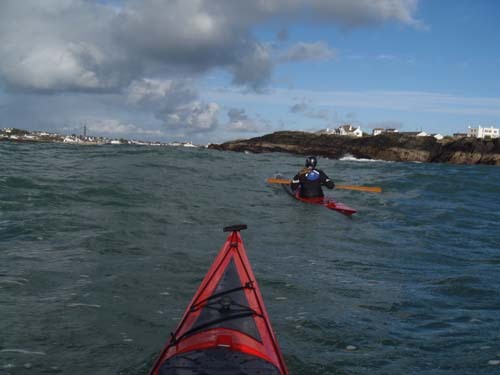 A windy paddle out of Trearddur Bay. Photos by Mark Tozer, George Maskell and Helen Wilson. Description: Helen Wilson and Mark Tozer will host a Stone Lagoon Full Moon Paddle with dinner on the spit. Meet in the parking lot by the boat launch area on the east side of the lagoon for an 8 p.m. launch. We will paddle to the spit and light a bonfire, so bring something to eat and drink, as well as some kind of light for your kayak. This trip is suitable for beginners, and all forms of watercraft are welcome.